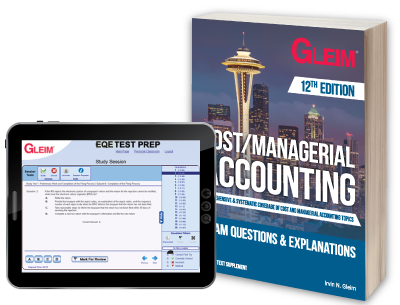 The Gleim Cost/Managerial Accounting EQE Book & Test Prep is an integral component of the Exam Questions & Explanations Books & Test Prep set. Outline material and comprehensive practice questions will improve your study process in an intuitive, interactive environment. The Book/Test Prep Set–Cost/Managerial Accounting is essential for learning and reviewing the concepts and applications of cost and managerial accounting. Students and professionals alike benefit from studying a comprehensive blend of objective questions from certain exams, such as the CPA, CMA, and CIA. Join the millions who’ve passed with Gleim! Signature authorization required: the Online Storeallows you to sign your name electronically with ease and convenience. Orders may also be placed with the assistance of an international consultant, by emailing order requests to international@gleim.com, faxing them to 352.375.6940, or by calling 352.375.0772 ext. 146.